wiiw Opinion Corner: EU migration crisis - What can and should be done? wiiw migration expert Isilda Mara looks into official migration statistics and puts the current migration flows in relation to past crises. Last but not least, she makes the case for an EU quota regime. From the start of the civil war in Syria in 2011 up to July 2015, the number of Syrian asylum seekers in the EU was 348,540 – just one-twelfth of the total number (4 million) who fled to neighbouring countries such as Turkey, Lebanon, Jordan and Egypt. The latest data from the office of the United Nations High Commissioner for Refugees (UNHCR) indicate that the total number of refugees (i.e. 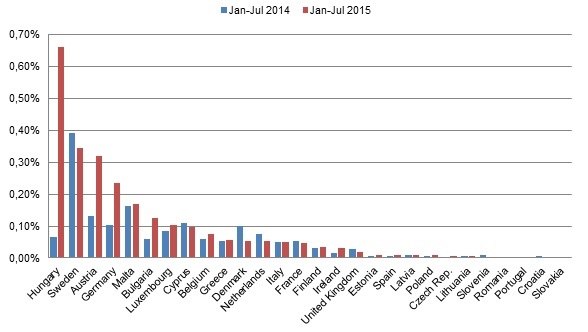 not only from Syria) who came to the EU-28 in the period January–July 2015 was 437,384 – 62% more than in the same period of 2014. 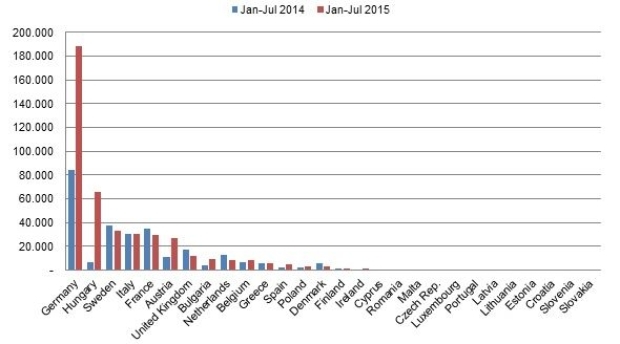 In absolute terms, the five EU-28 countries that have taken in most recent asylum seekers are: Germany (188,486), Hungary (65,415), Sweden (33,234), Italy (30,233) and France (29,832) – see graphs. Overall, the number of refugees who arrived in 2014–2015 (a little over 1 million) is no more than 0.2% of the total EU population (507 million). On average, then, across the EU-28 there is one refugee for every 504 inhabitants. In 1956, in the wake of the Soviet invasion of Hungary and the armed resistance to it, close to 300,000 Hungarians fled to and found shelter in (first of all) Austria; in a second stage they settled there and in other European and overseas countries. In 1968, the Soviet occupation of Czechoslovakia generated an exodus of 162,000 people from the country; they were temporarily settled in Austria and afterwards moved to other western countries. Between 1990 and 1991, more than 200,000 Albanians were offered shelter abroad, particularly in Italy, Greece and Germany. The war in Bosnia and Herzegovina between 1992 and 1995 produced more than 1 million refugees; half of them were hosted by European countries, mainly Germany, Austria and Sweden. In 1999, more than 800,000 ethnic Albanians from Kosovo were forced to flee their homes; Albania and Macedonia (a combined population of 5 million) had to accommodate them in the first stage, though the EU took a large number of them afterwards. It cannot be denied that historically the EU has offered shelter to a considerable number of refugees who have escaped persecution and death. Nevertheless, the current European reaction has largely been to protect itself from the refugees, rather than offer protection to them. There have been disagreements between EU Member States, and the slow, confused, and haphazard management of this humanitarian crisis has dominated the response of the EU, which is reluctant to accommodate even a modest 40,000 refugees from the war-torn area. When people’s lives are under constant threat – and very likely will continue to be so – the current apathy of the EU is not only playing into the hands of xenophobic parties, but is also serving the interests of human traffickers and smugglers, who are cashing in on the situation. At present, the EU agenda on migration (and especially the existing asylum system) is restricted in how it deals with this humanitarian crisis. While frontier countries such as Italy, Greece and Hungary (but also Macedonia and Serbia) are overloaded in offering protection to first-time asylum applicants, a number of EU states are refusing to share the burden. The May 2015 proposal (which was rejected) for quota schemes and tradable quotas allocated according to certain criteria (total GDP, population, level of unemployment and existing number of refugees) was supposed to give EU countries some flexibility in distributing the burden equitably. On the one hand, the system of quotas and the mechanism of exchange would allow countries overburdened with refugees (i.e. hosting more than their quota) to be rewarded and compensated for their efforts; on the other hand, those countries hosting less than their quota of asylum seekers would pay other states to take up the extra burden. First, the existing EU asylum system leaves it up to individual EU countries to decide on the number of refugees to be hosted; secondly, it allows individual EU countries to apply restrictive measures or to introduce various legislative norms to control the flow of refugees; and thirdly, it contributes to a disproportionate distribution of asylum seekers. So an important step forward would be to change the existing approach to dealing with the humanitarian crisis and asylum seekers in a destination country. How? The redistribution mechanism proposed by the EU in May is an option that should be taken seriously. Such a scheme may raise certain ethical concerns, because the principles of humanitarian and asylum rights, as established by the United Nations and the Fourth Geneva Convention, should have clear priority. Nevertheless, a burden-sharing asylum system that obliges EU countries to adhere to common rules that comply with fundamental rights might be a more effective system that would guarantee better protection and respect for the human rights of refugees. The EU countries would have less policy space at the national level, but a burden-sharing approach would smooth the rivalries between states in accepting responsibility. Instead of campaigns that seek to discourage people from migrating (which mainly fail), the EU countries should invest in campaigns to inform the public about the capacity of a country to host asylum seekers; about how individuals and private initiatives can engage with and offer support to refugees; and about how to deal with the situation. These steps would prevent xenophobic and racist parties from gaining ground. Another approach for the EU countries would be to ensure that immigration is perceived not as a threat, but as an opportunity. Refugees – people who escape from war and dictatorship – are also endowed with human capital: EU states should give them an opportunity to preserve and develop their skills. The EU should react smartly in order to reallocate those resources that are now (and will be) in great demand. Given that the EU population is aging, both low- and high-skilled workers will be in demand. Therefore, EU policy makers should think positively and offer refugees not only protection, but also an opportunity to contribute to the host society (i.e. provide them with access to the labour market).